Home » Aqua Master Online » One Million Yards? 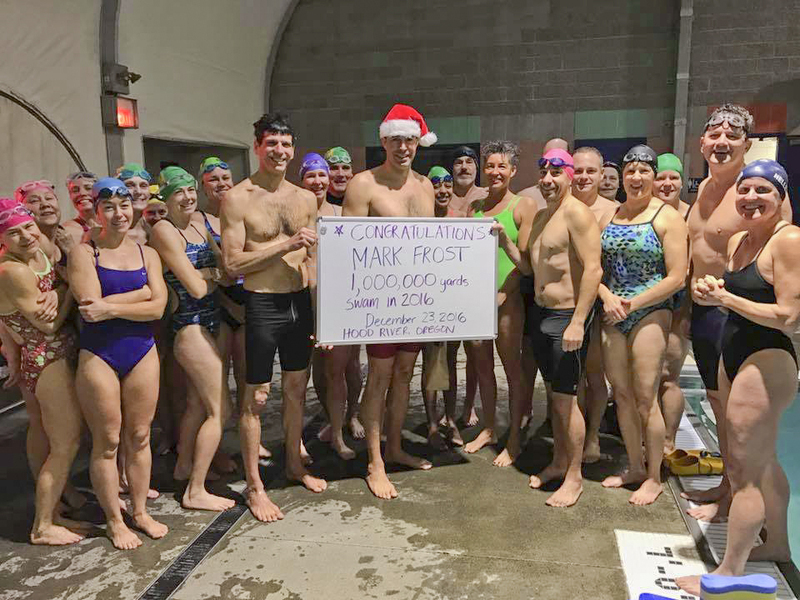 Mark Frost’s celebration of swimming 1,000,000 yards in 2016. 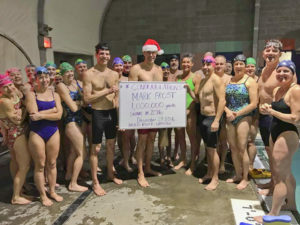 He is accompanied by the Columbia Gorge Masters swimmers. Mark says, “I swim 4 or 5 days a week, when I am not traveling for work. Since I travel for work, I also swim one or two times on the weekend, on average. This yardage also includes one or two open water swims a week during the summer. And competitions (e.g. the Association Meet… and the summer OWS racing… 10km, 5km, 3km, 1500m, 1000m, 500m). “One Million Yards is only 2,500 meters per day all year long. I usually try to get in around 4,000 meters each time I get to the pool,” Mark says. He forgot to mention that a person can’t swim 365 days/year due to pool closures, etc., so that yardage has to be made up another day. Good work Mark. There are only 7 Oregon swimmers who swam farther than Mark, one of which is 82-year old Dave Radcliff. Great job! That is real dedication to swimming. The Oregon LMSC had 75 Swimmers, who signed up for “Go the Distance”. Cumulatively they swam 21,332.96 total miles, or 284.44 average miles/swimmer. Listed next are the 75 swimmers, in the Oregon LMSC, and the distances they each swam in 2016. There are only 8 swimmers who accomplished the 1,000,000 yards or more. Michael Carew swam over 1,000 miles (1,769,627.2 yards). Incredible! Congratulations to all “Go The Distance” swimmers!